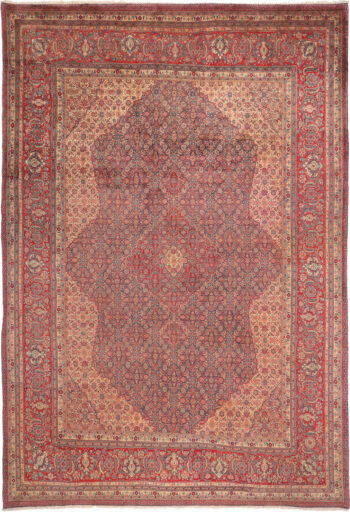 Rugs from Sarouk (also spelt Sarough, Saruk, Sarug, Sarouq, Saruq) are among the most popular and decorative Persian carpets. Oriental rugs have been in woven in Sarouk and the surrounding villages since historical times. These rugs are mostly marketed through Arak in west-central Iran and are sold under different (city) names, like Mahal, Ferahan (Feraghan), Lylyan, Malayer, Viss, Meshkabad (Mushkabad), Mirabad, Seraband, Mohajaran, Jozan. From the 1920s on their design has been influenced by the renowned Ziegler / Zeigler workshops towards European taste preferences. After WWI this shifted to the US market, and The American Sarouk with red, blue, and pink as dominating colours, was born. Traditional patterns include curvilinear and geometric layouts, Herati and boteh motifs, medallions in all shapes and sizes, and a medallion-and-corner design.